In New Zealand’s largest city, a pioneering project is underway to reconnect a community with its local park. The initiative, known as the Blake Road Reserve project, is part of Auckland Council’s ‘Adopt a Park’ programme. It explores how to connect the recreation industry with the community through the re-creation of a public space. The goal of the project is to reactivate Blake Road Reserve and the surrounding community, which is excited about revitalising the park and bridging the gap between the park and the industrial precinct across Auckland’s Harania Creek. Blake Road Reserve neighbours commercial, industrial and residential areas, borders the harbour margins and has a history of being revered by the community. However, the park has, in recent times, been attracting unwanted behaviours and the attention of the police. Parks are people-centric, and the aesthetic of a recreational setting can influence whether people decide to dwell in the park or hurry through the space. The Blake Road Reserve project aims to increase community use of the park by creating a more desirable space and a greater connection to the nearby industrial district. The idea of improving the park’s reputation originated from the combined leadership of Auckland Council, the Australasian steel company Pacific Steel, New Zealand Police, the local school and residents – all of whom questioned the symptoms of a space that had lost its connection with the community. Blake Road Reserve faces numerous challenges, including physical isolation from nearby parkland by clogged waterway, with low wet areas of poor drainage. The park has also been overrun by numerous weed species and debris, and had become a site of petty crime, including vehicle break-ins and damage. As a result, the park has seen a lot of commuter foot traffic, but minimal recreational use. Utilities and infrastructure dominate areas of the park. Parks are people-centric, and the aesthetic of recreation setting can influence whether people decide to dwell in the park or hurry though the space. Pacific Steel is a local steel product manufacturing company and the Blake Road Reserve project’s major sponsor. Workshops were held with steel mill staff between shifts to find out the workers’ views on the park. Pacific Steel is funding an upgrade of the park’s facilities and new planting. Alongside this support, Pacific Steel has been working with a bridge design and construction company BridgeIT New Zealand, to develop a bridge connecting the park with the existing reserve on the other side of the estuary inlet. This will effectively double the park’s area, allowing for loop trails and create an easier commuter route to the steel mill from the main residential area. The bridge will incorporate steel rebar products, representing Pacific Steel’s investment into Blake Road Reserve. The bridge design has begun, taking into account consultation and customer survey feedback regarding the bridge’s location. Parks are an expression of democracy. 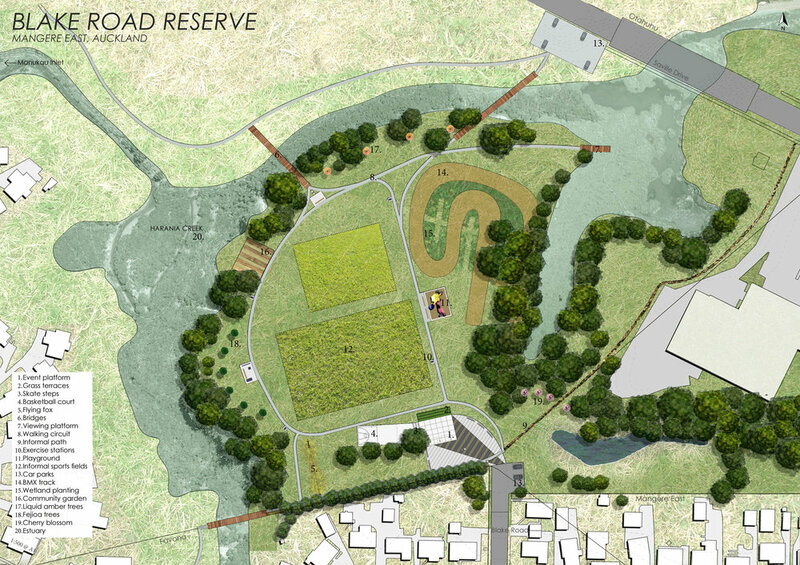 On the surface, the desired outcome of the Blake Road Reserve project was collaboration with the community and council to develop the best design solution. However through community consultation and external funding from Pacific Steel, a larger goal to win community trust by convincing leaders that Blake Road Reserve has potential to draw people back, was established. The first community contact was a questionnaire given to the students of Sutton Park Primary School in early 2015. The students were asked what they liked about the park and what they would like to see happen there, and their feedback was used to determine the possibilities and outcomes for the site. The questionnaire was also given to the Pacific Steel employee groups, giving the workers an opportunity to provide their input. In September 2015 a community consultation workshop and barbecue was held at Sutton Park School by Auckland Council, in conjunction with Pacific Steel, to discuss the future development of Blake Road Reserve. Three concept plans were presented, and the workshop was an opportunity for the community and school to give feedback and discuss what they wanted to see at the park. With this feedback, the team was able to develop a final design concept, described by Carlos as “an infrastructure node generated through event urbanism”. An early goal was to maintain the 2.8-hectare public reserve’s active open space integrity whilst also allowing for small-scale interventions. The first stages of the project started in November 2015, with vegetation management and rubbish cleared from the park. A community open day was held in that same month, with the local community able to come to the park and see the proposed project plan. There was a range of fun activities for everyone to enjoy, including bouncy castles, sports equipment, and a large game of Connect Four. Local Police officers also came along to show their support. Currently the project has an estimated 5-year completion life, with the opportunity of continued investment potential for the future. The next proposal of work to commence on site is by Auckland Council’s water management company, which will be clearing out weeds and silt from the denigrated estuary area running through the park, along with various forms of rubbish and debris. This will improve the local ecosystem and remove any potential hazards within the waterway. In February 2016, the Auckland Council has installed a half basketball court and hoop on a former building foundation within the park, serving to initially reintroduce recreational activity to the community. The court is proposed to start as a half court and eventually be upgraded to a full court if usage demands require an additional hoop and court space. The renewal of the BMX track will begin with materials and equipment supplied by Pacific Steel and Auckland Council to upgrade the track and create a safer riding capacity for the community. The local bike crew, Triple Teez, will lead the rehabilitation of the bike track. In the past Triple Teez has maintained the track by painting any exposed tyres and metal in silver paint. Another community open day was held in February 2016, organised by Auckland Council in collaboration with Pacific Steel and the Council Out and About programme. The open day offered a volleyball net, rock climbing wall, BMX bikes, and basketball competitions using the new hoop. The next phases of the project include vegetation clearance and some initial trail construction, to lead up to the sites for the proposed bridges and loop trail construction. The BMX track will undergo further upgrading, and access ways and commuter trails to the park will be joined together in an all-weather route that will service commuter cyclists and recreation walkers. Mulch will be laid over proposed pathways, to review usage throughout the park. If the paths are well used, then the Auckland Council will invest in some aggregate or concrete pathways for the primary routes. The Blake Road Reserve project will revitalise an under-utilised park, creating a desirable space and connecting the community with the nearby industrial area. Using the park to establish and maintain relationships is an overt goal. Auckland Council has set out to give the community license to reinstall the park for the people of Mangere, and steward its ongoing care. Landscape affects every one of us, whether we were born here, are now living here, or whether we are travelling through New Zealand. Landscape affects our aspirations, the places we live in, who we are and what we identify with. May 22 URBAN BIODIVERSITY OR URBAN DESERT?